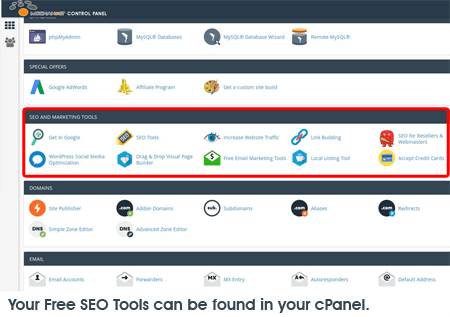 To help you succeed online, we've included a powerful set of tools in our cPanel control panel - called "SEO and Marketing Tools". The tools are included for free with for any of our Shared Reseller Linux Hosting packages. Getting started is easy! Just Sign Up for any of our Shared Reseller Linux Hosting accounts and then log in to your website control panel (cPanel) and click any of the "Free Search Engine Optimization (SEO) Tools" icons. Awesome. Thank you, thank you and thank you again! My web site is on top in Google! Attracta's services are straight forward and produce results! I have used, and paid for, many SEO services which do not even compare to Attracta! It's amazing to type in some keywords on the major search engines and see your company be #1 or #2. Thanks Attracta, keep up the good work! The best SEO I ever tried! I get to see the results without waiting weeks. Thanks so much for the ease of use and low cost. My Google Analytics traffic report has jumped by over 15% every month since I started. These new visitors are staying longer and buying more. Thanks Attracta. Search marketing expert Ryan Dorhn (Brain Swell Media) talks about the results he's delivered to hundreds of clients using Attracta's search engine submission service. Based on Attracta's XML Sitemap technology, the service delivered a 10X increase in leads for one client, and Google indexing for another just 7 hours after submission of its first Sitemap.